A well-made and visually different guitar that proves to be a versatile electro option. Over-use of overlay transfers. Thick gloss finish. Slightly boxy tone. The CB-Rose Plus offers a choice of solid backs. This is a versatile electro-acoustic model. The LR Baggs LR-T DX provides the plugged-in sounds. The neck features a distinctive crane overlay. Crafter's position in the UK market is a far cry from the company's humble beginnings. Starting life with a team of just four working in a basement flat in April 1972, the company produced classical guitars under the brand 'Sungeum', primarily for the Korean domestic market. 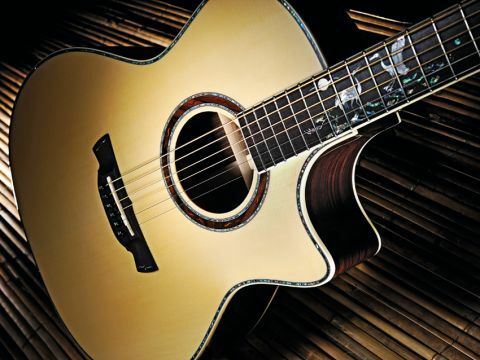 A decade later, production was expanded to include acoustic and electro-acoustic models, at which point the guitars began to develop international appeal. "Inside, everything is clean and tidy, with no signs of dust, loose wood or excess glue." With the understanding that Sungeum wasn't the easiest brand name with which to take on the world, 1986 saw the company rename its products Crafter. The 140-strong workforce now produces in excess of 60,000 guitars per annum, with the UK being Crafter's biggest market, apparently taking 10,000 guitars annually. Our review guitar, the CB-Rose Plus, is one of two models marking Crafter's 39th anniversary. Both feature an elaborate fingerboard overlay picturing a pair of crane birds spanning nine frets. The anniversary models come with the option of either a solid rosewood or solid mahogany back. The inclusion of a solid back differentiates the CB-Rose Plus from the laminate on previous anniversary models. The CB-Rose Plus is a Grand Auditorium body shape with a smooth Venetian cutaway, which provides access up to the 21st fret - one more than many Grand Auditoriums - giving a high C# in standard tuning. The CB-Rose's soundboard is bookmatched Engelmann spruce, edged with a strip of abalone (which we suspect to be a thin overlay). This has also been used to edge the wood soundhole rosette and top the bridge pins that flank the Indian rosewood bridge. The two-piece solid rosewood back features a parquetry-like overlay, which has been fitted across the centre join. Crafter has chosen a laminate for the sides, no doubt in an effort to keep the guitar affordable. The two- piece mahogany neck is fitted using a dovetail joint and is bound to match the guitar's front and back. Inside the CB-Rose everything is neat, and the patented scalloped T-Brace pattern is clean and tidy with no signs of dust, lose wood or excess glue. In truth, the high- gloss finish is a little over enthusiastic and can, on occasion, feel a bit gloopy. Overall the CB-Rose is very well presented, comfortable to play and underscores why Crafters are so well-liked by retailers and players alike. Electrics are handled by the re-voiced LR Baggs LR-T DX Tuner Preamp, which is mounted in the shoulder position. Simple and easy-to-use twin rotaries and four sliders operate the unit's key features, although the smaller push-button tuner, mode and phase knobs could do with being slightly larger. Handily, the tuner works whether the guitar is plugged in or not. Despite its smaller body size, the CB-Rose pushes a fair amount of air and produces a full, bright tone with good volume. There's good overall note separation and the ever-present mid-range gives strength to single-note runs and solos. While responding generally well to dynamics, there are hard limitations when really digging in. At times, the CB-Rose suffers from sounding somewhat boxy and tight, particularly when A/B'd with a similarly priced Tanglewood TW45 and Freshman FA400. No doubt, given time, the CB-Rose will loosen up and its tone will open out. That said, the dry, woody timbre is perfect for some vintage ragtime fingerpicking. Plugged in, the LR Baggs system is very likeable with good versatility. Certainly there's a wide range of sounds to hand and we'd suggest that plugged in is where the guitar really earns its stripes. Crafter has managed to ensure that its 39th anniversary models are more affordable than most special editions and for that reason alone it should be applauded. It's obvious that attention has been paid to the decoration, resulting in an individual-looking guitar. Some, though, might prefer for the budget to have been spent on higher-spec woods to further improve the sound quality. But as an electro, we were impressed with the results, and if you're in the market for a capable electro that's visually a little different from the norm - crane birds 'n' all - you might be, too.